Canadian fighter jets bomb an ammunition depot in northern Libya in the first attacks by Canadian aircraft in the campaign to enforce a no-fly zone over the North African nation. Canadian fighter jets have bombed an ammunition depot in northern Libya in the first attacks by Canadian aircraft in the campaign to enforce a no-fly zone. Maj.-Gen. Tom Lawson, assistant chief of the air staff, said Wednesday that four Canadian CF-18 fighters, supported by two air-to-air refuelling aircraft, flew two missions over the North African country — one late Tuesday and another Wednesday morning. The Canadian planes used "several laser-guided 500-pound bombs" to destroy an ammunition depot in the northern city of Misrata on Tuesday night, Lawson told reporters in Ottawa. He said the missions were intended to neutralize Libyan military capabilities before they can be used to harm civilians. This was the first time Canadian jets have bombed Libya since airstrikes by a coalition of countries began. Before Tuesday night's bombings, they had only accompanied other nations' planes. U.S. Rear Admiral Gerard Hueber said Wednesday that international forces were attacking Libyan government troops who had been storming population centres. "From Benghazi, which we now believe to be under opposition control, we have moved west to Ajdabiya," Hueber told Pentagon reporters by phone from the U.S. command ship in the Mediterranean. From Ajdabiya to Misrata, the coalition's "targeting priorities" included Gadhafi's mechanized forces, mobile surface-to-air missile sites and lines of communications that supply "their beans and their bullets," Hueber said. Earlier, officials said missiles from F-15 fighter jets destroyed Gadhafi missile sites around Tripoli. International forces also struck a government ammunition depot outside Misrata and ground forces outside Ajdabiya, officials said. Residents of Misrata said coalition attacks had forced government troops to withdraw tanks there. The CBC's Margaret Evans, reporting from Benghazi on Wednesday, said people in that city credit the coalition airstrikes with saving it and with keeping it from falling back into Gadhafi's grip. 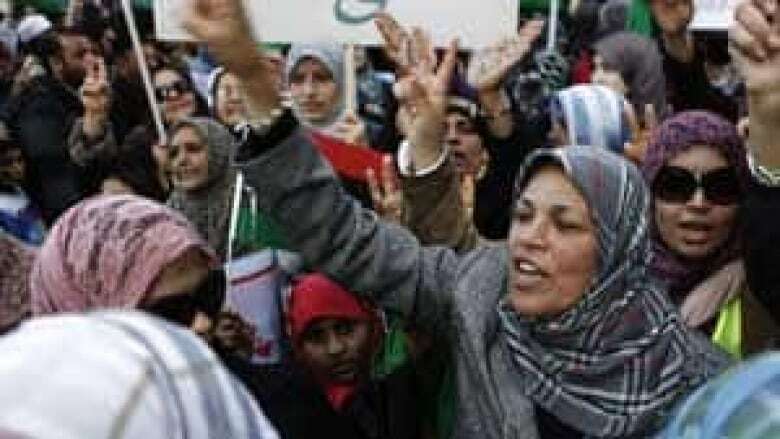 "There were actually demonstrations here calling on the coalition to do more to help cities in the west under attack by Gadhafi forces, Misrata, in particular, where we're starting to see a bit more coalition activity," Evans said. "The people in Benghazi in the east, the rebels, they want it because they believe it will help their own momentum, especially if they decide to push west to take Gadhafi territory. "There is also a sense here that the conflict might last a lot longer than they had ever expected or hoped for, a realization that air power can't accomplish everything. It's one thing to attack a column of tanks in the open desert, another to go after Gadhafi's soldiers inside a city like Ajdabiya, which is just south of here, currently under siege, when there are civilians inside. "So there is a little bit of a feeling here that people might be hunkering down for the long haul." 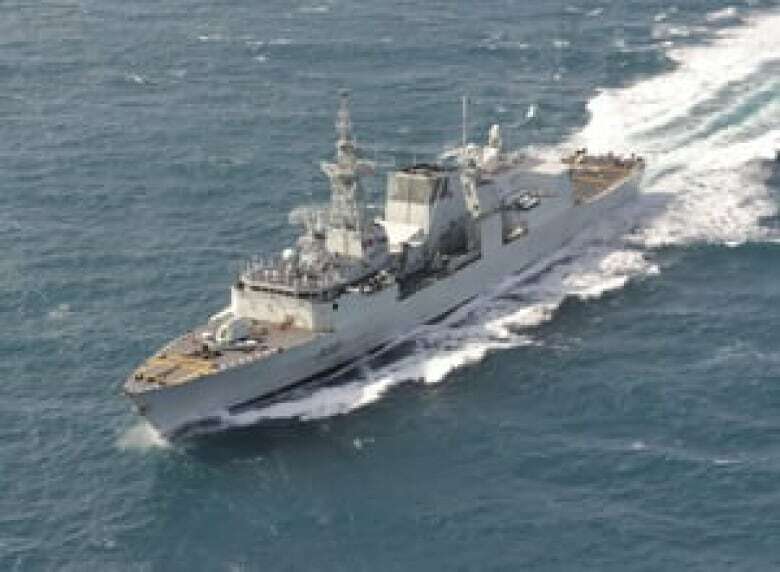 The Canadian navy is also helping enforce an arms embargo against Libya, added Commodore John Newton, assistant chief of the maritime staff. HMCS Charlottetown has been doing surveillance in the area since March 14, Newton said. Meanwhile, NATO warships have started patrolling areas off Libya's coast as part of an effort to enforce an arms embargo. Canadian Brig.-Gen. Pierre St. Amand said naval operation Unified Protector "is now underway" with six vessels involved during the first day of patrols. NATO had already received offers of up to 16 ships to patrol the Mediterranean off Libya, he said. NATO Secretary General Anders Fogh Rasmussen said Tuesday that NATO ships and aircraft in the central Mediterranean would conduct operations to "monitor, report and, if needed, interdict vessels suspected of carrying illegal arms or mercenaries." The U.S. price tag so far for the no-fly zone in Libya easily tops hundreds of millions of dollars. As of Tuesday, the U.S. and European coalition had fired at least 162 sea-launched Tomahawk cruise missiles priced at $1 million to $1.5 million US each, and dispatched B-2 stealth bombers — flying round trip from Missouri — to bomb Libyan sites. Many other warplanes are involved, and there are 11 navy ships in the Mediterranean, including three submarines and two amphibious ships. The cost could rise moderately if the U.S. role is limited, with the Pentagon using its existing budget to cover the expense, or it could jump significantly if the operation drags on for weeks or months. Meanwhile, disagreement remains among the countries participating in the Libyan operations following the UN Security Council's authorization of the no-fly zone to protect civilians from Gadhafi's attacks. The U.S. military has shouldered the bulk of the military mission in Libya, but President Barack Obama said it would soon hand over responsibility, presumably to NATO. "When this transition takes place, it is not going to be our planes that are maintaining the no-fly zone," the president said. NATO spokeswoman Oana Lungescu said an agreement could not be reached on Wednesday, but "there is a sense that views are converging on a possible NATO role to enforce the no-fly zone,"
In Paris, French Foreign Minister Alain Juppé announced that a "contact group," including the United States, France, Britain and other countries, will meet in London on Tuesday. He told French legislators the gathering is aimed at showing that the international operation is not being handled by NATO, but by a broader group of countries. He said the African Union and the Arab League will attend. Gadhafi, who has rejected calls to step down after 42 years in power, remained defiant late Tuesday when he made his first public appearance in a week. He told enthusiastic supporters at his residential compound in Tripoli that he would keep fighting. "In the short term, we'll beat them, in the long term, we'll beat them," he said in a statement broadcast on Libyan state television. More than 330,000 people have fled Libya since the unrest began, the United Nations office for humanitarian affairs said. The precise death toll from the violence in Libya is unclear. Rebels say more than 1,000 people have been killed in a month of fighting. Gadhafi loyalists have said the death toll is closer to 150.